This week we're featuring the fun children's collection, Building 101. 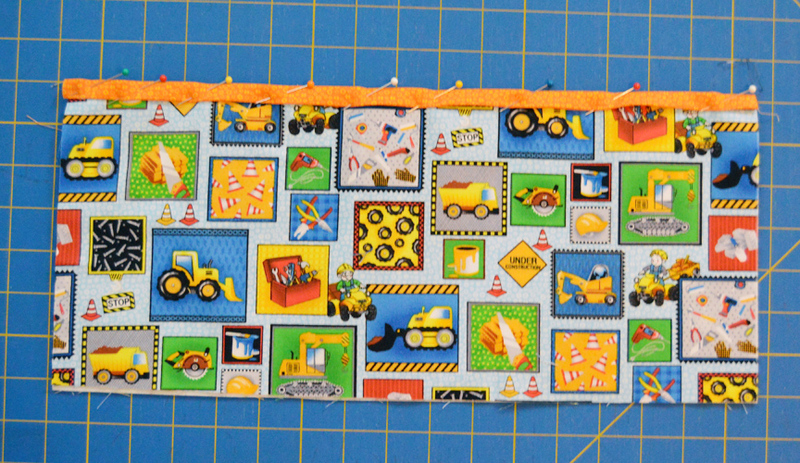 Plenty of construction equipment and tools for all those future builders! We used the Building 101 fabrics to make a Car Carry-All that has four rows of pockets. 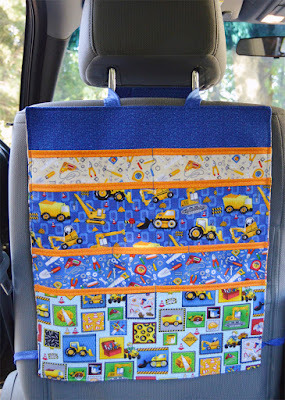 This helps keep all those toys, books, snacks and who-knows-what-else organized on car trips. 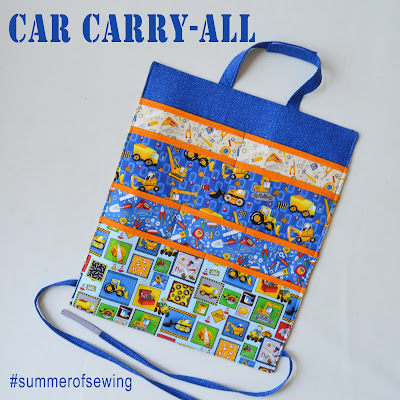 Simply attach it to the back of the car's front seat, stuff with supplies, and go! Step 1: Fold the 13" x 16-1/2" patchwork print piece in half wrong sides together to it measures 6-1/2" x 16-1/2". Press. Slide the 6-1/4" x 16-1/2" interfacing piece in between and fuse to secure. 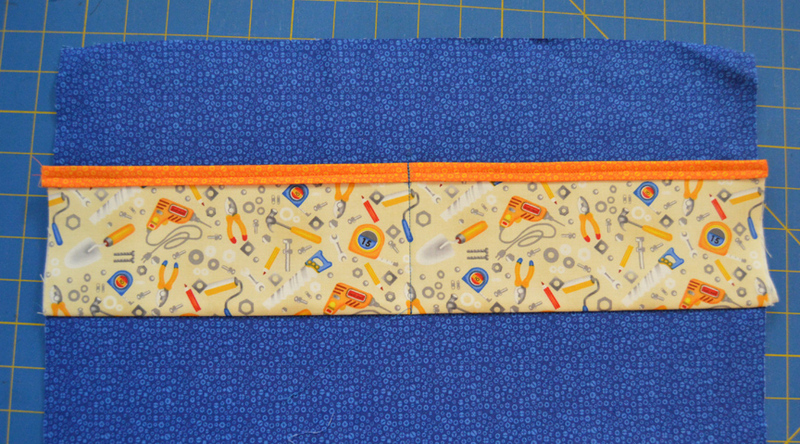 Step 2: Fold (1) 1-3/4" x 16-1/2" orange tonal strip in half lengthwise, wrong sides together, and press. 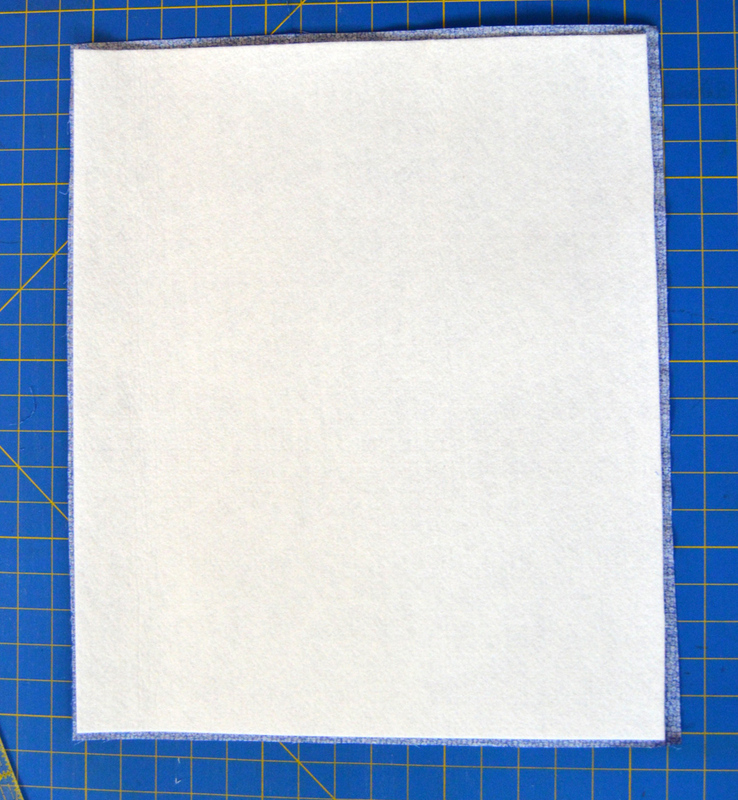 Unfold and then fold and press each long edge in to the center fold line. 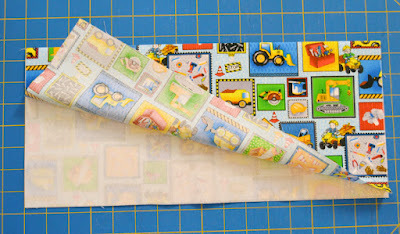 Step 3: Tuck the folded edge of the patchwork print piece in to the center fold of the orange strip. Pin in place and topstitch to secure. 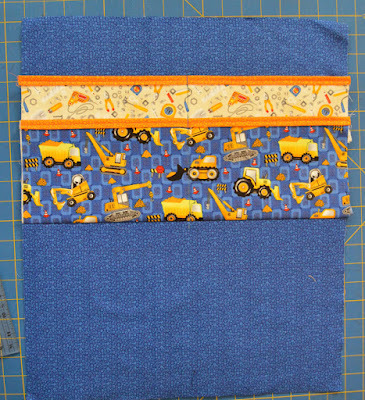 Step 4: In the same way, make the (3) remaining pockets. Step 5: Center and fuse the Peltex piece to the wrong side of the 16-1/2" x 19-1/2" blue tonal piece. Step 6: Measure down 6" from top edge of the background piece and draw a horizontal line. Position the cream tools pocket face down, matching the raw edges to the marked line. Stitch using a 1/4" seam allowance. Step 7: Fold the pocket up and press firmly. 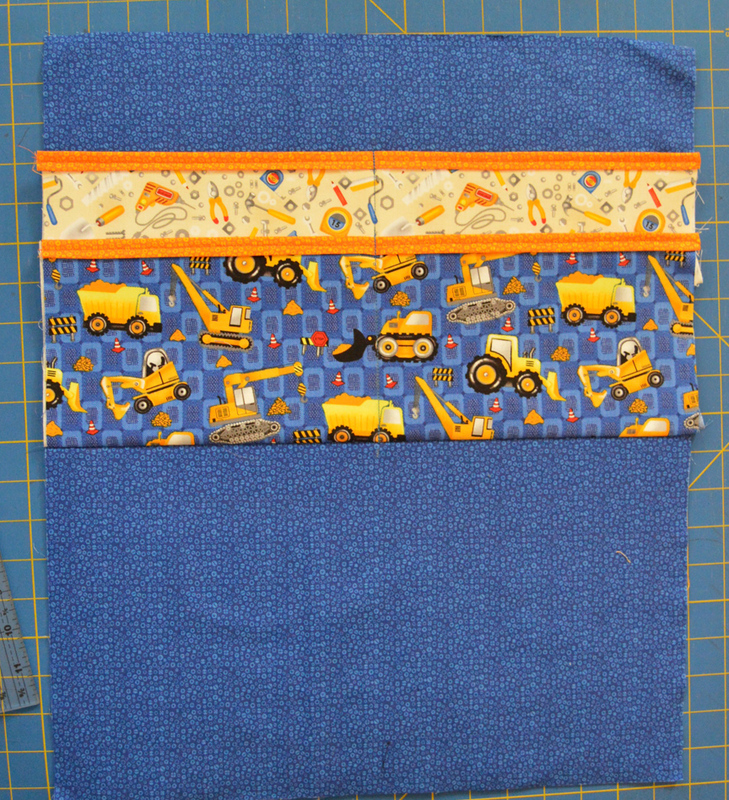 Measure and mark a vertical line at the center point of the pocket. 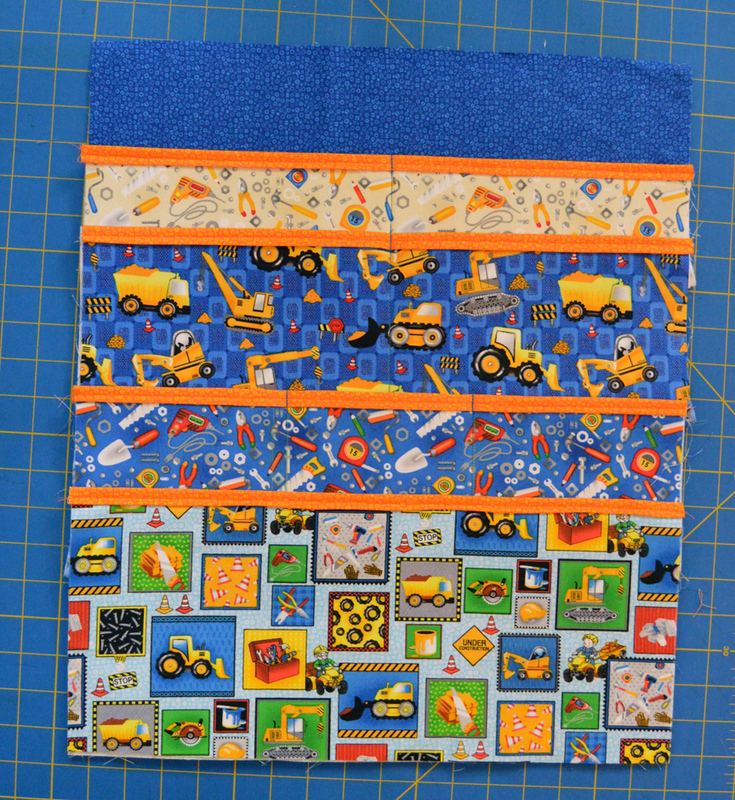 Stitch to secure, backstitching several times at the top and bottom of the pocket. This divides the pocket into (2) separate sections. Step 8: In the same way, measure and draw a line 10" down from the top edge. 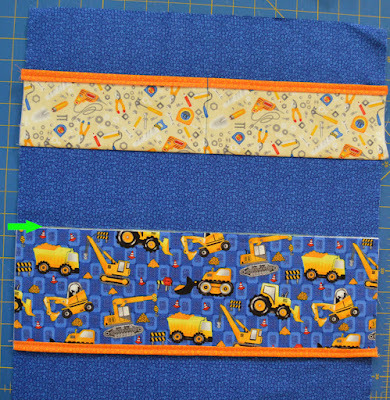 Position the blue construction pocket along the bottom of the drawn line (Note: Because this is directional fabric, make sure your pocket is oriented so the fabric is right side up.). Stitch. 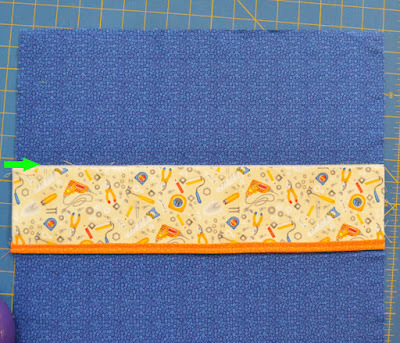 Step 9: Press the pocket up and then mark and stitch a center line to divide the pocket into two sections. Step 10: In the same way, measure 14" down from the top edge and draw a line. Position the blue tool pocket along the bottom of the drawn line. Stitch. Step 11: Press the pocket up. Mark vertical lines on the pocket 5-1/2" from both outside edges. Stitch to create three pocket sections. Step 12: Position the last pocket along the bottom edge of the background fabric and baste the bottom edge to secure. Step 14: Trim the skinner strips as needed. Note: Ours are trimmed to 22" and fit well on a typical sedan seat. You may want to measure around your seat before trimming. The strap can be tucked into the crack between the back and the base of the seat. 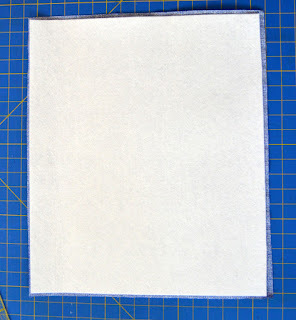 Step 15: Pin the shorter strips to the top edge of the background piece, approximately 5" in from each side. Position one strap with the Velcro face up and one face down. Pin the longer skinny strips on each side, 2" from the bottom corners. 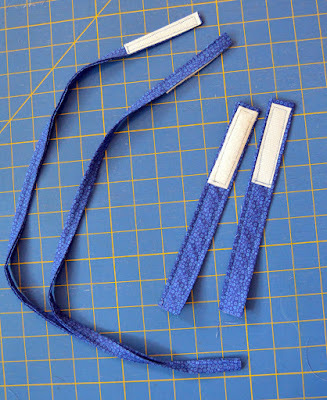 Position the strips with one Velcro piece face up and one face down. Step 16: Lay the 16-1/2" x 19-1/2" backing piece face down on top and stitch around all four edges, leaving a 14" opening on the bottom for turning. Try to stitch just outside the Peltex edge. Backstitch over the ends of the four strips to add extra security. Step 17: Turn the piece right side out and press. Press the raw edges of the opening in. 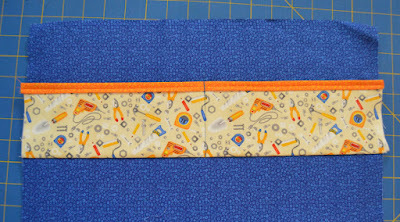 Topstitch around the entire carry-all, which will close the opening. Your carry-all is done and ready to use! In the car, ready to fill! 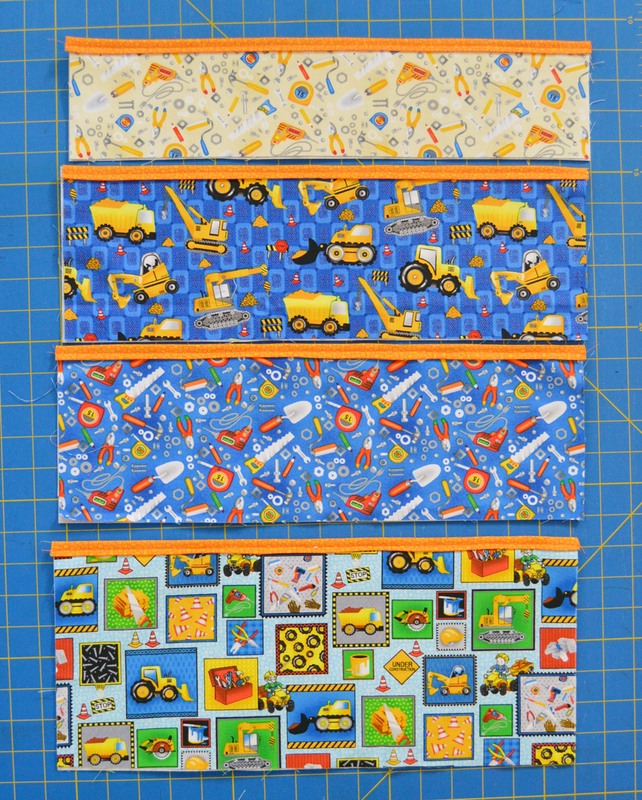 Want to win a FQ Bundle of Building 101? Leave a comment below or on IG and tell us your go-to car snack! Giveaway is open through Monday, September 4th at 11:59 PM CDT. 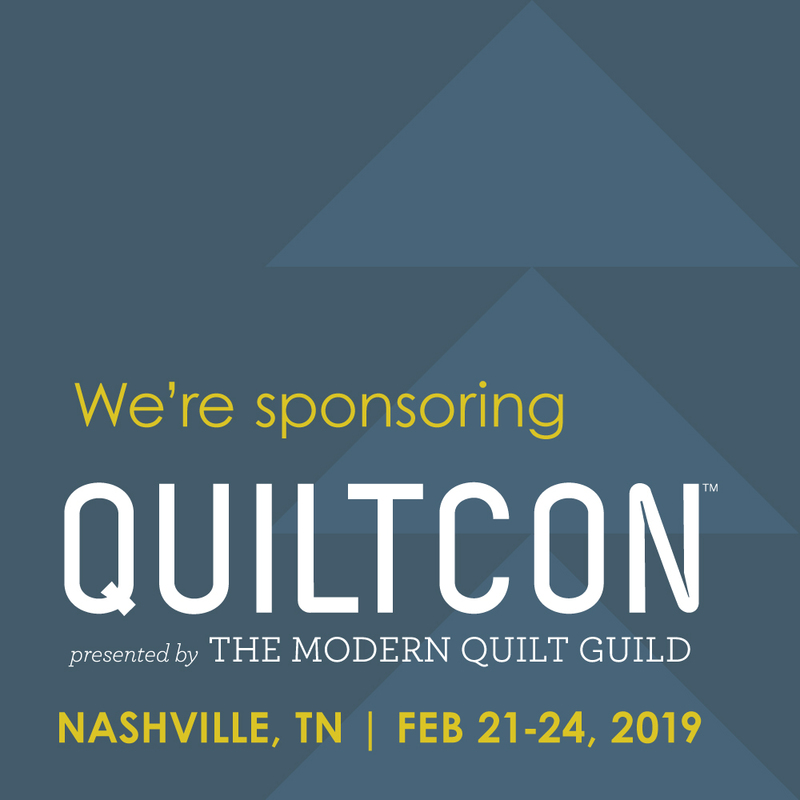 See the entire Building 101 collection here and ask for it at your local quilt shop. Almonds are my go-to car snack. And I always have a bottle of water with me. 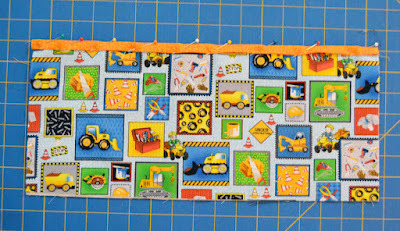 Building 101 is a great collection for little boys who love to build...my little guy sure loved it! He's now building John Deere tractors! My favorite on the road snack is whatever fruit I can grab without being messy. Bananas, grapes, apples are favorites. We always take along packs of cheese crackers with peanut butter, and fruit. Helps keep down costs on a long drive! I love to keep granola bars in my purse for a quick snack--especially KIND bars. Water for sure, and then either chocolate (if it's not too hot), or bananas. ( but you got to get rid of the peel soon, or you'll be sorry! ) Great tutorial. Thanks for sharing the giveaway. Never go anywhere without a few Scotch mints.And a bottle of water. Go to snack is apples. 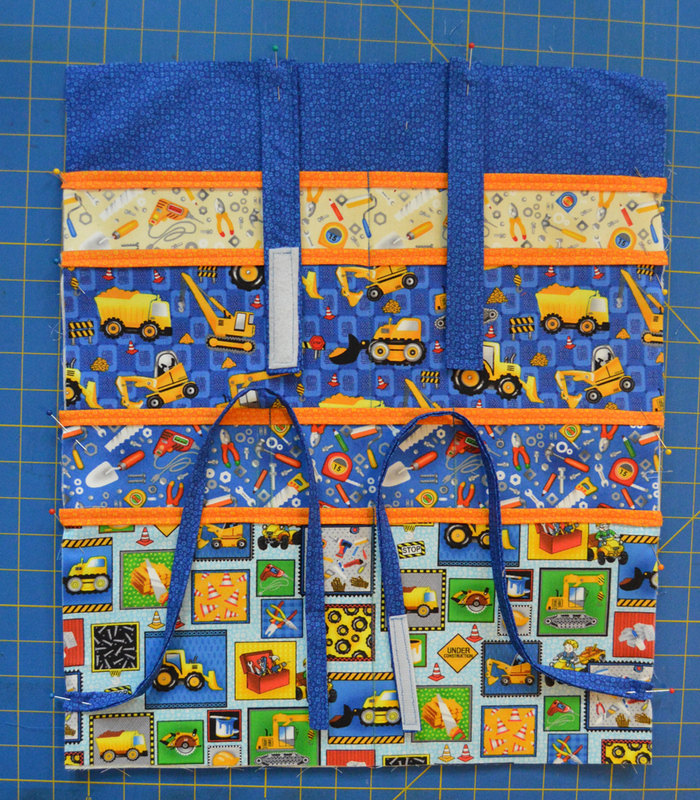 I was making a bag for a toddler this week too. cheese sticks, Grapes or fruit that can be cut up and eaten that way, and bottles of water are my snacks for the car. I'm gonna be the unhealthy one and confess to peanut butter M & M's as a guilty pleasure! 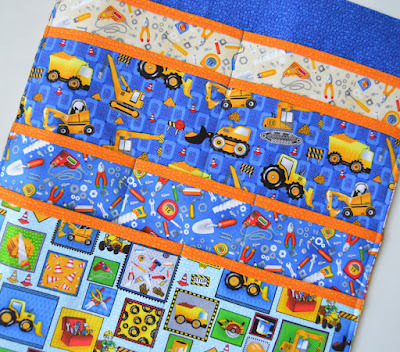 My grandson would love this adorable fabric! We love to snack on popcorn when we're on a road trip. I'll snack on fruit bars. I always have some Luna bars for a car snack or apples! 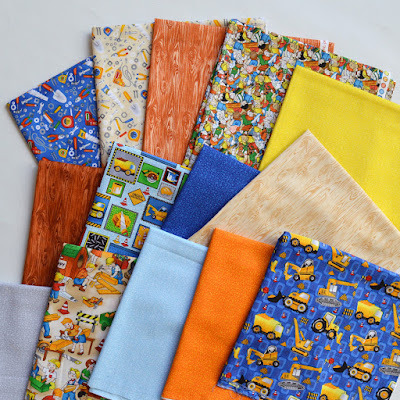 Great fabric and tutorial! My personal favorite car snack is sunflower seeds in the shell. I picked up this habit going to my kids ball games. Keeps me awake on long trips! Love the fabric. My favorite car snack is coffee and almonds. 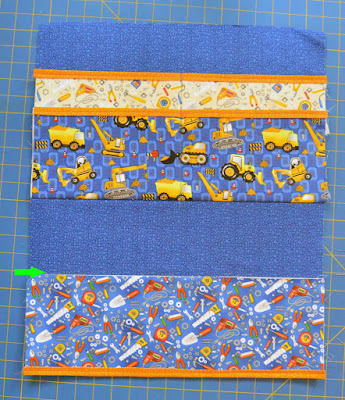 I can see a project for my grandsons. 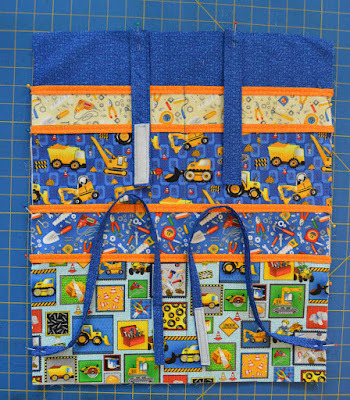 What a nice carrier and the fabric is really fun. Favorite snack...chocolate covered almonds!! Great project. I bake chocolate chip cookies for road trips, bring lots of water, and grapes and carrot sticks for healthier snacks. My daughter usually provides car snacks--and it's usually candy! Thanks for all the great tutorials and Happy Labor Day weekend! Sunbelt granola bars are a must in my family!!! Gummies or sliced apples are the go to snack for my grandkids! 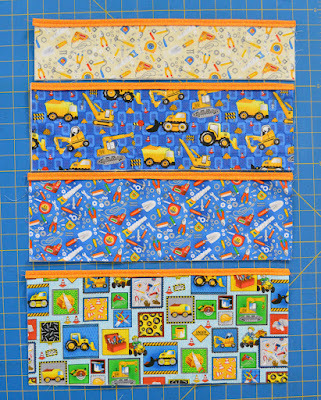 What a great tutorial with such fun fabrics! My favorite car snack is a bag of ruffled potato chips! LOL. But I also love fresh fruit! Thank you for sharing and a chance at winning this great fabric! Salted nut roll--always get hungry for them! I love to eat popcorn in the car. Messy, I know, but delicious. Thanks!